Every day at least 12 children and young people get the news they have cancer. Each September Childhood Cancer Awareness Month helps to highlight the impact of cancer on young people and their family. This, in turn, helps us to protect more children, improve the lives of young cancer patients and bring hope to them and their families through our groundbreaking research. This year we have a number of exciting ways for you to take part in the campaign; read below to find out how you can get involved! Wearing a Childhood Cancer Awareness Month ribbon not only symbolises your support for those affected by cancer, it also helps to drive meaningful change. Only 3% of cancer research funding focuses on childhood cancer. The treatments and care children need can differ from adults. This makes childhood cancer research vital to improving survival rates. With the help of our supporters we currently fund over 60 research projects, however, more funding is needed to drive breakthroughs and help keep families together. For Childhood Cancer Awareness Month 2018, we’ll be finding out what motivates all of the amazing people that support those affected by childhood cancer with our #WearTheRibbon campaign. Why do you want to raise awareness for Childhood Cancer Awareness Month 2018? Who would you wear the ribbon for? Is it a child or family affected by childhood cancer? Or maybe the staff that help care for these amazing children? Send us your reasons for wearing the ribbon, or discover some of the reasons of supporters on our #WearTheRibbon page. 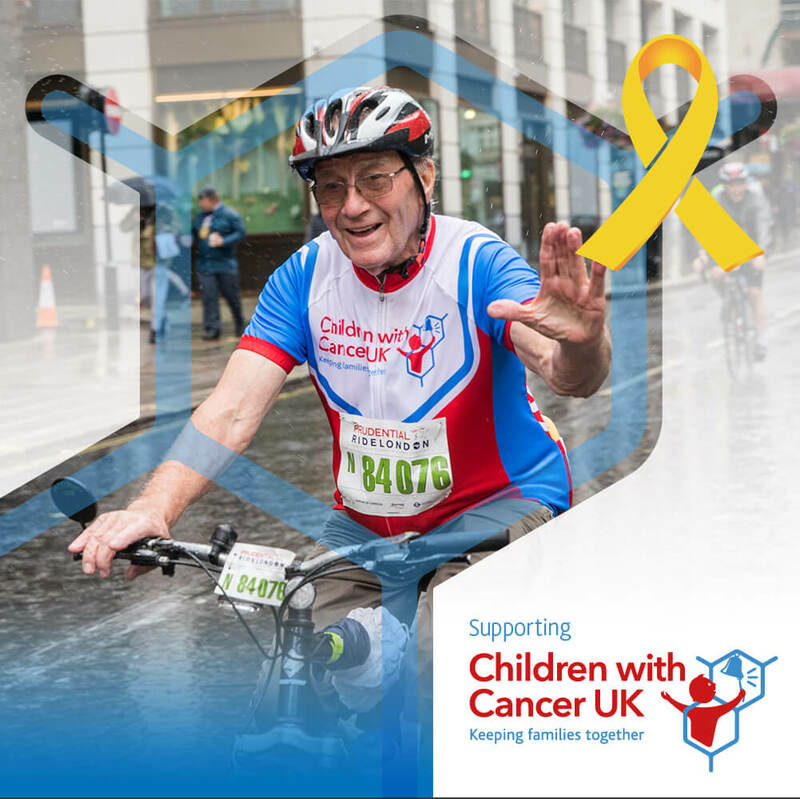 To show your support and spread awareness of Childhood Cancer Awareness Month and Children with Cancer UK, you can use one of our custom made social media profile frames throughout September. Help us inspire the world to contribute to a better future for our children! We hosted our International Science Conference ‘Cancer in Children and Young People International Scientific and Medical Conference 2018’ in London on 12th – 14th September. The Conference brought together leading research scientists from across the world to discuss advances in Precision Medicine and how it can be used to treat children and young people with cancer. Childhood Cancer Awareness Month is one of the busiest times of the year for us, with plenty of events taking place all in aid of supporting those affected by childhood cancer. Please see below the events that we’re involved in this September and find out more about how you can support Children with Cancer UK. This September we’ll be celebrating the reasons why people wear The Cancer Awareness Ribbon. See our #WearTheRibbon page for more details. We’ll be collecting donations at a Crystal Palace football game to help fund donations for vital research. More information regarding the event will be available soon. Here’s our selection of races that are taking place over Childhood Cancer Awareness Month 2018, click on the links to find out more! We’re celebrating Childhood Cancer Awareness Month 2018 with our Gold Ribbon Appeal. Who do you wear the ribbon for? Do you wear the ribbon for a world where no child dies of cancer? Or do you wear the ribbon for all those who support the children and families affected by cancer? 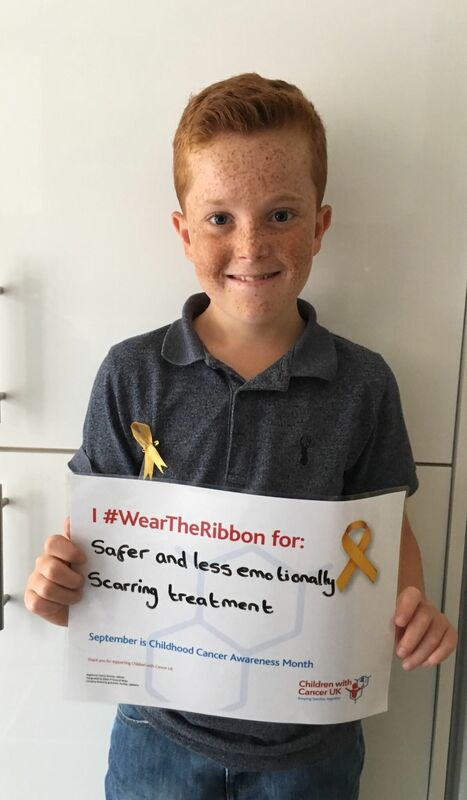 Visit our Gold Ribbon appeal page to see some of the reasons why people wear the ribbon and donate to help fund groundbreaking research, helping families stay together for longer. We’re currently running a TV appeal that highlights the difficulties that families face when their child has cancer and the moment that all of these families hope for, their child ringing The End Of Treatment Bell. Learn more about the TV appeal and view the video by clicking on the button below. Dr Darren Hargrave discusses precision medicine and the impact it could have on the treatment of childhood cancer. Elliott has faced cancer three times and is still only 19. Elliott talks about how he copes with treatment and his positive relationship with those in charge of his care. Charlotte talks about how cancer affected her when she was 13 and how she kept a very positive attitude. Charlotte has since gone on to run the London Marathon for us. Charlotte’s mum Pam talks about the impact a childhood cancer diagnosis can have on a parent and how the family coped. Professor David Walker talks about how childhood cancer is different to adult cancers and why it’s so important to fund research into childhood cancer. In 2017, for Childhood Cancer Awareness Month we celebrated the positive impact of research in childhood and young person’s cancer by asking families to share their ‘Golden Moments’ from their child’s cancer journey. These moments are memories that will never be lost and show that even in difficult circumstances hope is a force for good. Please continue to send us your inspiring stories. We shared the Golden Moments that have been sent to us throughout Childhood Cancer Awareness Month 2017 and posted them on our dedicated page. You can also share your moment on your social profiles and use the #OurGoldenMoments hashtag. With so many wonderful golden moments being shared with us, below are just a small selection, however, you can see all of #OurGoldenMoments here. One that sticks in my head is when she was first able to move about again and play after her open surgery. It was awful to see her so poorly after her operation to remove her right kidney so this moment was so precious to us. It was what we all needed after the year we had. So off we went to Greece for a 7 day all inclusive holiday. We had such an amazing time and came back feeling ready to take on the world. It was a holiday I would never forget, Seeing Ethan’s smiles and laughter and him enjoying life again was priceless. My daughter Sophie, graduated from preschool. She starts school in September. This was an incredible golden moment after a year and a half of chemotherapy treatment for Acute Lymphoblastic Leukaemia. We are so proud of her! 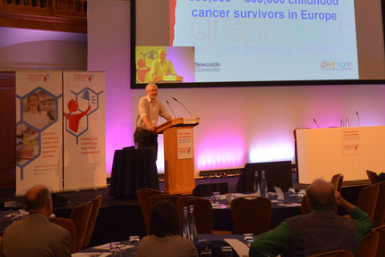 We hosted our International Science Conference ‘Childhood Cancer 2017’ in Newcastle in September 2017. The Conference brought together some of the leading paediatric cancer research scientists from across the world to discuss advances in Precision Medicine and how it can be used to treat children and young people with cancer. Throughout September we shared a number of new videos and podcasts about current cancer treatments and new advances in the field and the impact of this on the treatment of childhood cancer. To fund real breakthroughs, we aim to match extraordinary children with extraordinary researchers in order to benefit as many children as possible. Of course, these projects can be very complicated! To help explain a couple of these, we asked some amazing children to translate our life-saving research to help others to understand! Childhood cancer survivor Louis and his twin sister Grace help explain Dr Zoë’s research project we’re funding on rhabdomyosarcoma, a type of sarcoma cancer. Sam and Ross help to explain Dr Kathleen Birley’s research into immunotherapy, which is becoming an increasingly important tool in the treatment of cancer. Ellie was diagnosed with Acute Lymphoblastic Leukaemia in October 2015. Her mum, Kate recently completed the London to Paris bike ride in aid of Children with Cancer UK. In this very powerful visual podcast, Ellie and Kate talk about Ellie’s childhood cancer journey for Childhood Cancer Awareness Month through a number of photos. For Childhood Cancer Awareness Month 2016 we did a number of things to raise awareness of childhood cancer and the research going into it. Jet filling stations supported us by helping to raise awareness during Childhood Cancer Awareness Month with our logo adorned on one of their petrol tankers and selling ribbons in 38 of their petrol stations. Please email us to find out how you can take part in Childhood Cancer Awareness Month 2018. What do your wear the ribbon for? Celebrating Childhood Cancer Awareness Month.